Meet compliance standards*, and recognize and respond to incidents. With our Managed Security Information and Event Management (SIEM) service, we will work with your current SIEM technology or bring the SIEM technology along with our service. Our team has the ability to implement a new SIEM and manage every aspect or take over and ensure your SIEM infrastructure is running and managed appropriately. Binary Defense led the AT&T Cybersecurity global partner community by identifying, architecting and delivering managed security services to a record number of customers. We can improve your cybersecurity and simultaneously give you time back in your day to focus on your key initiatives. We integrate with some of the best-in-class technology. Improve your cybersecurity by utilizing our Security Operations Center (SOC). This team of dedicated security analysts will detect and analyze advanced attack patterns and alert you of these malicious threats as soon as they are identified. These highly trained analysts will quickly set up and integrate into any existing network environment. We work with your team on understanding your environment and what is most important to you and establish customized escalation procedures to facilitate effective communication. The Binary Defense team provides detection and response every second of every minute of every day. Our security analysts are trained to understand and identify what real indicators of compromise are and how they can negatively impact your business. This experience gives us enhanced visibility and knowledge to detect and address rapidly evolving threats through our Security Operations Center. 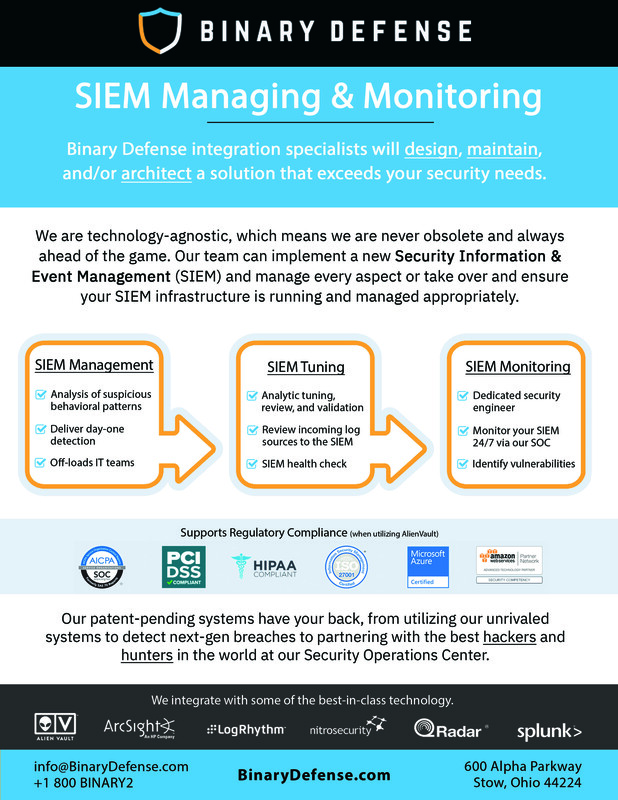 Binary Defense engineers can integrate into any type of SIEM infrastructure and replace endpoint protection software. We have a large selection of preexisting use cases, detection capabilities, and the ability to write custom connectors depending on data sources. Our patent-pending systems have your back, from utilizing our unrivaled systems to detect next-gen breaches to partnering with the best hackers and hunters in the world at our Security Operations Center. We are technology-agnostic, which means we are never obsolete and always ahead of the game. Our team has the ability to implement a new Security Information & Event Management (SIEM) and manage every aspect or take over and ensure your SIEM infrastructure is running and managed appropriately.